With the growth of new fire-fighting products it is easy to forget about humble fire buckets, used by generations of our ancestors to tackle some of the biggest historic blazes, including the Great Fire of London. Fire extinguishers have certainly become more accessible in recent years, even if they are still quite expensive and require a fair amount of maintenance. But fire buckets still have their uses. They have carved themselves a nice little niche on petrol station forecourts, campsites, caravan parks, barbeque pits and lots of other outdoor settings where small fires are likely. After launching the fire buckets category on our website last year, H&O Plastics has seen a large number of requests from campsites and other fire safety stockists for wholesale orders of our high-quality but cheap plastic fire buckets. They are good at tackling small blazes quickly – stopping them early on before they have a chance to get bigger. Fire buckets can be filled with water, sand or special fire ‘absorbing’ powder to smother different types of fire quickly and effectively. Keeping them close at hand means there is no time wasted in tackling a blaze. They are particularly useful on campsites where fire can spread very quickly. They also have an advantage outdoors because they are hard-wearing. You can leave a lidded fire bucket outside for five years and it will work just as effectively as it did on day one. 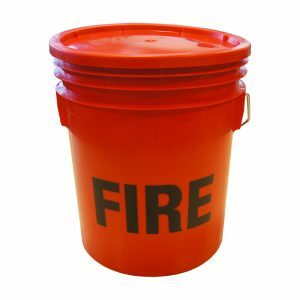 A fire bucket filled with water can be used on Class A (involving organic solids like paper, wood, etc) types of fire either to supplement a water extinguisher or as a first attack if an extinguisher is not immediately available. Fire buckets filled with dry sand can be used as an absorbing agent or to dam a flow of flammable liquid. Do not allow fire buckets to be misused, left empty or used as a bin. Throw at the base of the flames and ensure that all areas of the fire are out. H&O Plastics started manufacturing large red plastic fire buckets in 2016 and have filled dozens of wholesale orders since then. Some of the feedback we got from customers said that they wanted a cheaper, larger and higher quality alternative to other plastic fire buckets. H&O Plastics can offer higher quality products at lower prices than our competitors because we manufacture and sell all the products ourselves. There are no distributors taking a cut and no unnecessary costs – just great UK-made products at fair wholesale prices. What makes our fire buckets different? With a 16L volume, our plastic fire buckets are larger than most plastic fire buckets available to buy online. They hold more water or sand, giving you a better chance of extinguishing the fire at the first time of asking. The friction fit lid will keep the water or sand in good condition and the metal handle makes our fire buckets easier to handle in an emergency. Our plastic buckets are also made to be tougher. Manufactured at our Birkenhead production site, our containers have more raw material than others on the market and will last longer than most plastic buckets imported from abroad. In England, an average of 27,000 fires are started on grass, heathland and moorland every year. That’s 73 fires per day. The UK has an average of 360 caravan fires per year, nearly one a day. Fire buckets are great for tackling fires on campsites, in caravans and in other countryside and outdoor settings, such as barbeque cooking. Under these conditions, fires can spread rapidly and being able to respond quickly is essential. Fire buckets are low-tech, lightweight and easy to transport. They can also be left outside for long periods of time without being compromised. 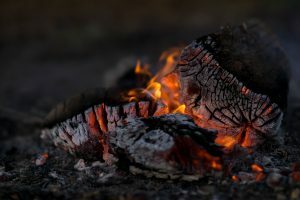 The Camping and Caravanning Club recommends that you keep a fire bucket full of water outside your unit, especially on campsites where no fire-fighting equipment is supplied.